Eric Metaxas Mr. Metaxas is the author, most recently, of “Miracles: What They Are, Why They Happen, and How They Can Change Your Life” ( Dutton Adult, 2014). Astronauts have had a unique perspective of Earth, home to us all. Having viewed it as a whole from above, they realize the finite nature of our planet and have had to weigh what humans may be doing to it through industrialization. The upshot is they’ve become supersensitive to published information relative to man’s potential influence on the planet but concerned over the direction NASA has taken on climate-change science. Earlier this month, a group of 49 former NASA astronauts and the scientists who put them in space and on the moon raised a red flag over NASA’s questionable embrace of climate-change alarmism. In a joint letter to NASA Administrator Charles F. Bolden, those American heroes admonished the agency for advocating a high degree of certainty that man-made CO2 is a major cause of climate change while neglecting empirical evidence that calls the theory into question. 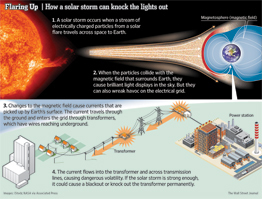 HOW VULNERABLE IS OUR ELECTRIC GRID TO A SOLAR SUNSTORM? Reuters U.S. electricity regulators are studying the impact of historic sunstorms. Pictured, a NASA handout image of the sun. With a peak in the cycle of solar flares approaching, U.S. electricity regulators are weighing their options for protecting the nation’s grid from the sun’s eruptions—including new equipment standards and retrofits—while keeping a lid on the cost. Among the events they are examining is the Canadian power outage of 1989. On March 13 of that year, five major electricity-transmission lines in Quebec went on the fritz. Less than two minutes later, much of the province was in the dark. The cause: A storm of charged particles from the sun had showered Earth, damaging electrical gear as far away as New Jersey and bringing displays of the aurora borealis, or northern lights, as far south as Texas and Florida. 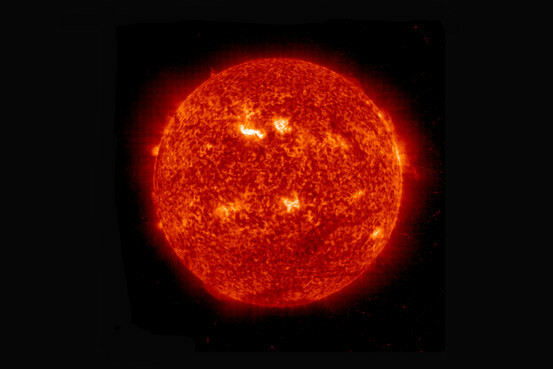 The sun is expected to hit a peak eruption period in 2013, and while superstorms don’t always occur in peak periods, some warn of a disaster. John Kappenman, a consultant and former power engineer who has spent decades researching the storms, says the modern power grid isn’t hardened for the worst nature has to offer. He says an extreme storm could cause blackouts lasting weeks or months, leaving major cities temporarily uninhabitable and taking a massive economic toll. Humans are born with the curiosity of scientists but switch to investment banking. Mr. Kaku, who is 65, enjoys making predictions. In his latest book, “Physics of the Future,” which Anchor released in paperback in February, he predicts driverless cars by 2020 and synthetic organs by 2030. If his forecasts sound strange, Mr. Kaku understands the skepticism. “If you could meet your grandkids as elderly citizens in the year 2100,” he offers, “you would view them as being, basically, Greek gods.” Nonetheless, he says, “that’s where we’re headed,” —and he worries that the U.S. will fall behind in this technological onrush. Huge excitement. Two Earth-sized planets found orbiting a sun-like star less than a thousand light-years away. This discovery comes two weeks after the stunning announcement of another planet orbiting another star at precisely the right distance — within the so-called “habitable zone” that is not too hot and not too cold — to allow for liquid water and therefore possible life. Unfortunately, the planets of the right size are too close to their sun, and thus too scorching hot, to permit Earth-like life. And the Goldilocks planet in the habitable zone is too large. At 2.4 times the size of Earth, it is likely gaseous, like Jupiter. No earthlings there. But it’s only a matter of time — perhaps a year or two, estimates one astronomer — before we find the right one of the right size in the right place. An attorney says NASA had a “knee-jerk reaction” when it fired a Christian employee after he mentioned intelligent design. David Coppedge, a 14-year employee for the Jet Propulsion Laboratory’s mission to Saturn, was fired last year for handing out DVDs to coworkers that mentioned intelligent design (see earlier story). He was issued a written warning for “pushing his religion” on coworkers, charged with harassment, and finally demoted. When JPL veteran filed suit, the company fired him, claiming his termination was necessary to reduce the workforce due to budget problems. JPL filed a motion for summary judgment, and the court held oral arguments, but reversed a tentative ruling. In a final decision, the court denied the summary judgment motion, and a Los Angeles Superior Court judge sent the case to a jury. Becker tells OneNewsNow that the theory of intelligent design is often mistaken for creationism, and causes a knee-jerk reaction. “Intelligent design has nothing to do with the doctrine of creationism, and people often confuse it with creationism because the central argument of intelligent design is that there is scientific evidence to show that the universe, and life within it, did not evolve randomly,” he explains. If we’re looking for a way to stimulate our economy, a new space race building on projects like SpaceX is a good place to start.